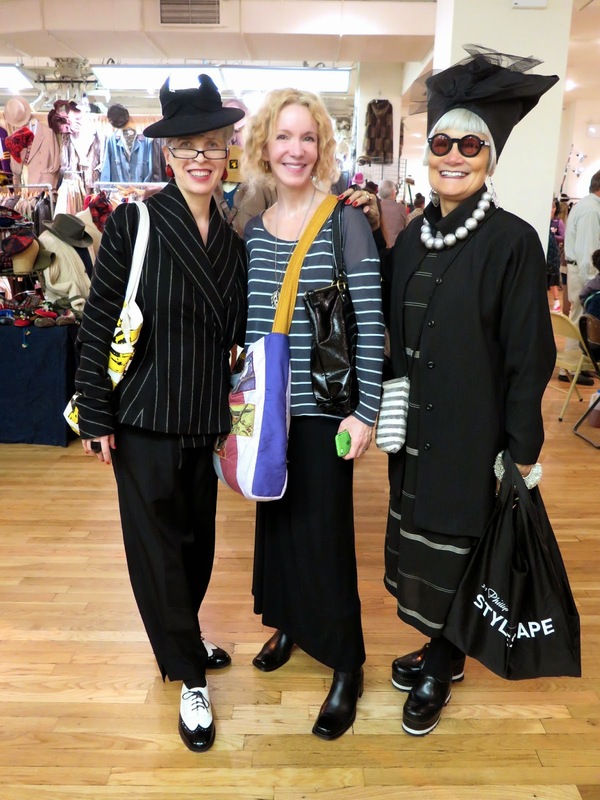 I feel so blessed to have met, and become friends with a group of stylish and creative women who live in New York. 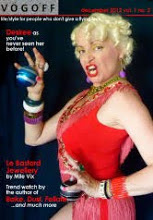 We share a passion for beautiful vintage clothing and accessories, contemporary art and design, thrift shopping, thoughtful conversation, and a sense of humour that often borders on the inappropriate. We love dressing up for no other reason that is is a new day, and one never knows what might happen. They are my tribe, and I cherish the time I spend with them each year. 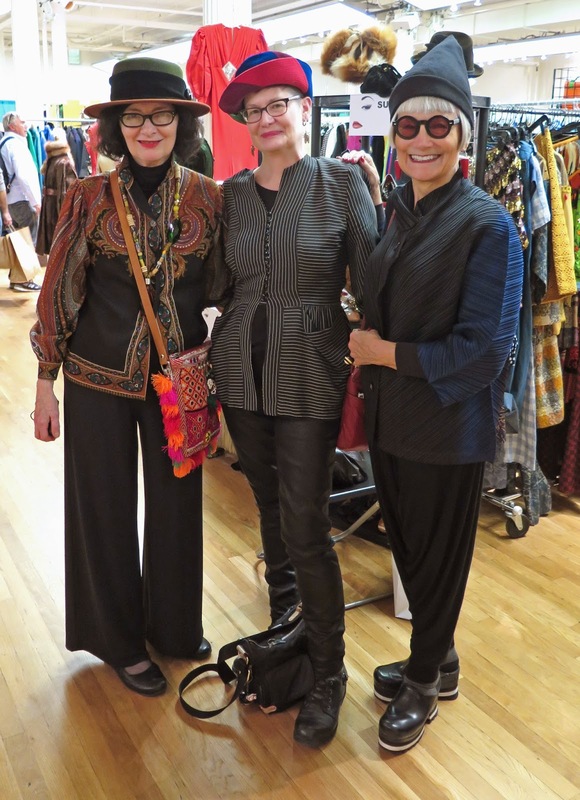 After I had done as much damage at Beacon's Closet as I could afford, Valerie and I met up with Jean, and artist, milliner, and fellow blogger Carol Markel (on the right, with Valerie in the photo above) at the Manhattan Vintage Clothing Show and Sale. I had met Carol a couple of years ago when I was in New York. 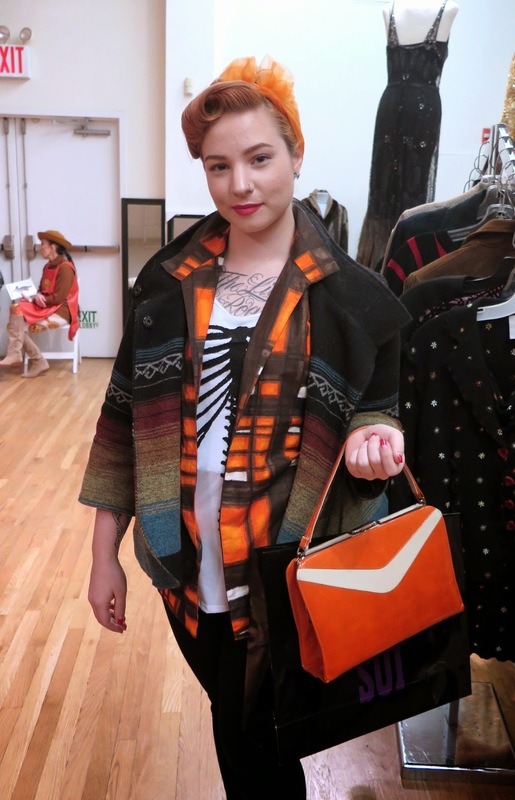 She loves bright colours, as you can tell by her striking coat and bag. Valerie is wearing the painted, open-toed booties she purchased at Nomad Vintage. Valerie snapped this shot of Carol, yours truly, and Jean. 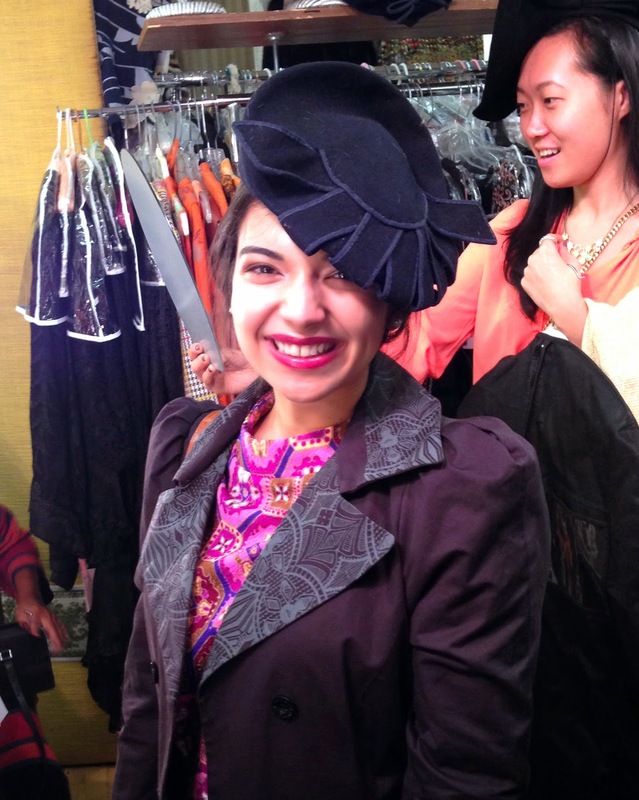 I am wearing the wonderful vintage hat that I found at a secondhand store in my neighbourhood for $8. I love when I get compliments in New York on things I've found in my neighbourhood thrift stores for next to nothing. 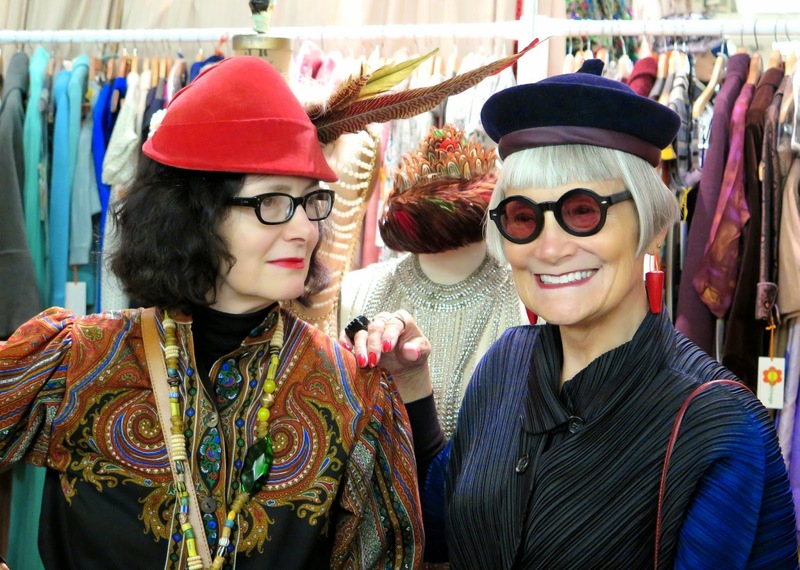 Carol and Jean had fun trying on hats at the Revival Vintage Boutique, and Carol took the red one home with her. It was the first time the owner had a booth at the show and and I think she found us very entertaining. 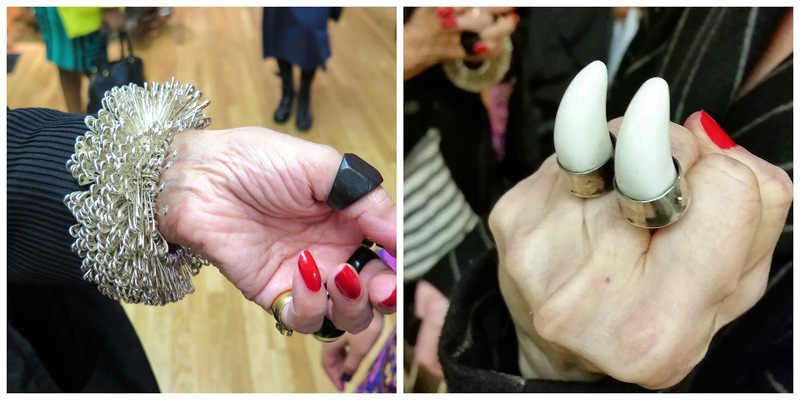 Jean and Valerie have the most amazing accessories - (l) Jean's safety pin bracelet, (r) Valerie was brandishing what I referred to as her sabre-toothed tiger ring. On Saturday, I was thrilled to run into Michelle, who I had met at the FIT Symposium on Thursday. 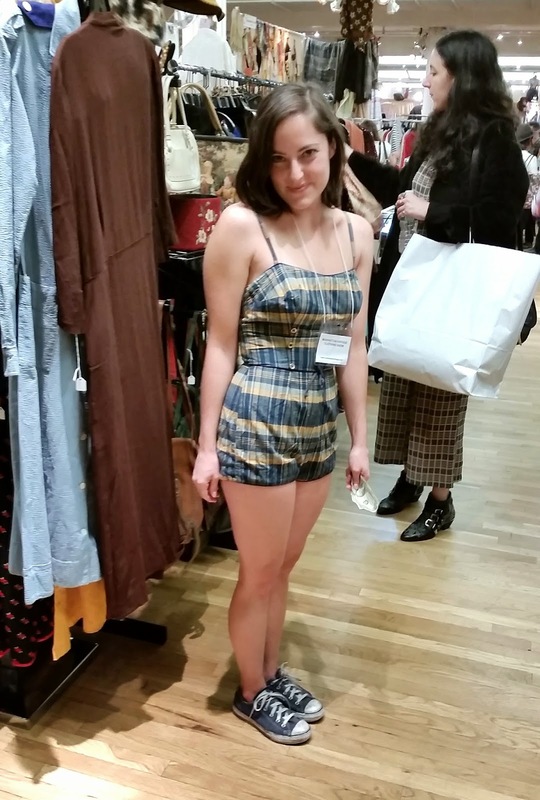 It was her first time attending the Vintage Show, she was so excited to see all the gorgeous stuff. It will be many years before she will be "a woman of a certain age", but she fit in with the tribe very well - it's about the sensibility, and not the years. The skirt I'm wearing is another of my scores from Beacon's Closet. Marja Samsom (aka The Dumpling Diva), who had joined Jean, Carol, Valerie and I the previous night for post-vintage show cocktails, brought her new puppy, Bibi, to the show. Bibi had also joined us the night before and I was able to indulge in some much-needed puppy snuggling. 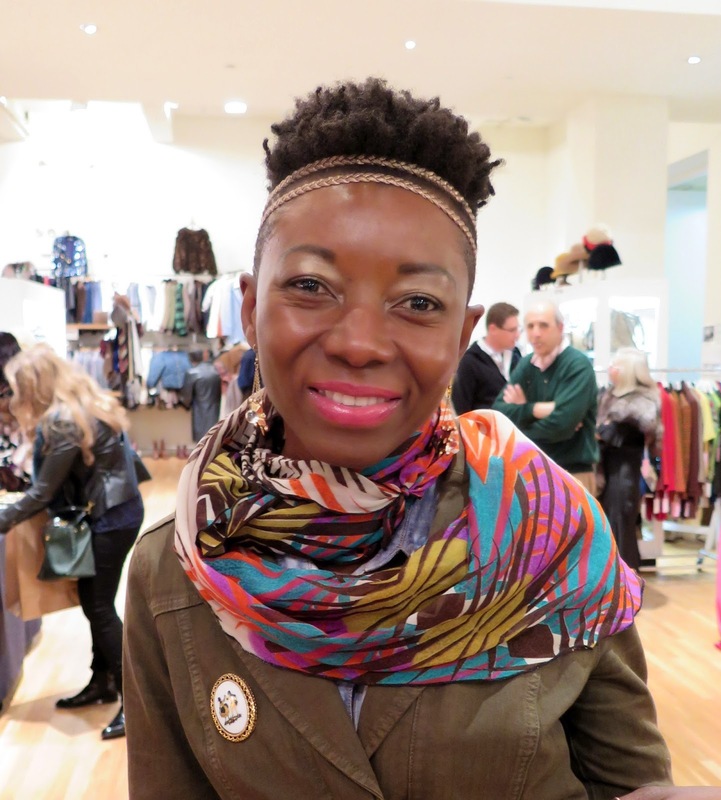 Another blogger to join the fold this year was Patti, (in between the Idiosyncratic Fashionistas) who had flown in from Florida that afternoon with her husband to spend a week in New York. We didn't get to spend much time together, but it was enough for me to see that she is the same sweet, articulate, and thoughtful woman as she appears on her blog. My eye was drawn to the mix of colours and shapes this woman was wearing. I've always liked blue and brown worn together and she is doing it with great panache. Her blue glasses are the icing on the cake. 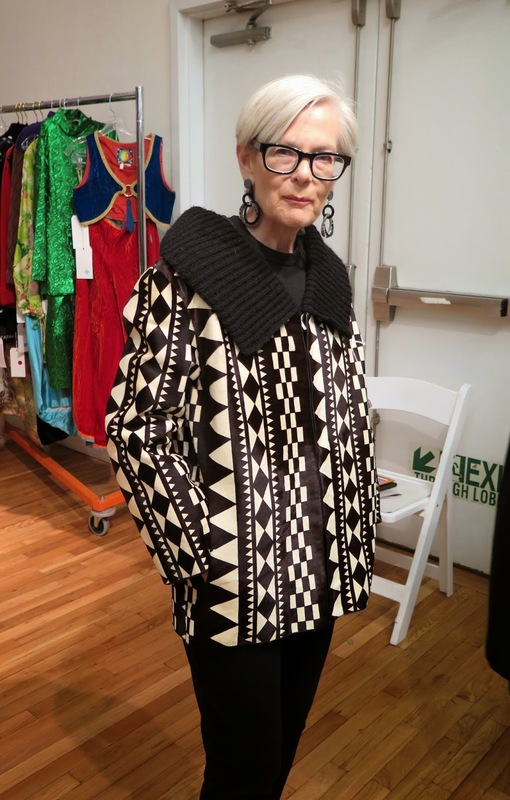 This woman was trying the gorgeous printed pony hair jacket I had been admiring at Lulu's Vintage Lovelies. 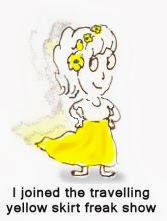 Her name is Lyn, and she has recently entered joined the ranks of bloggers of a certain age as the Accidental Icon. 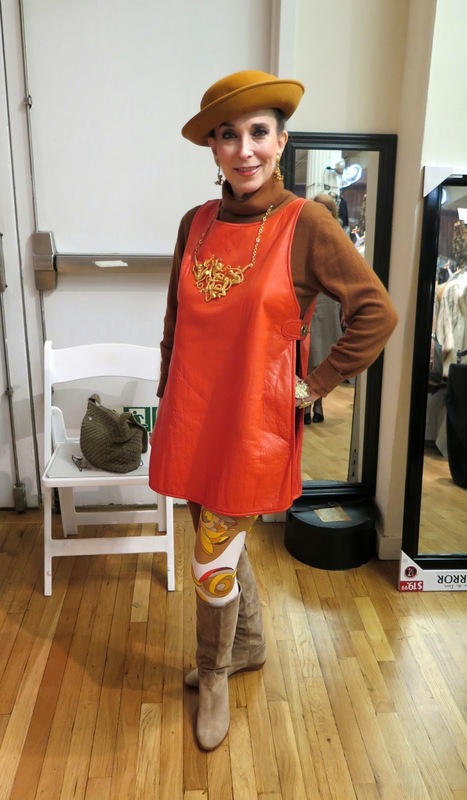 This incredibly chic woman was wearing a leather Bonnie Cashin tunic and stunning jewellery designed by Eric de Kolb. 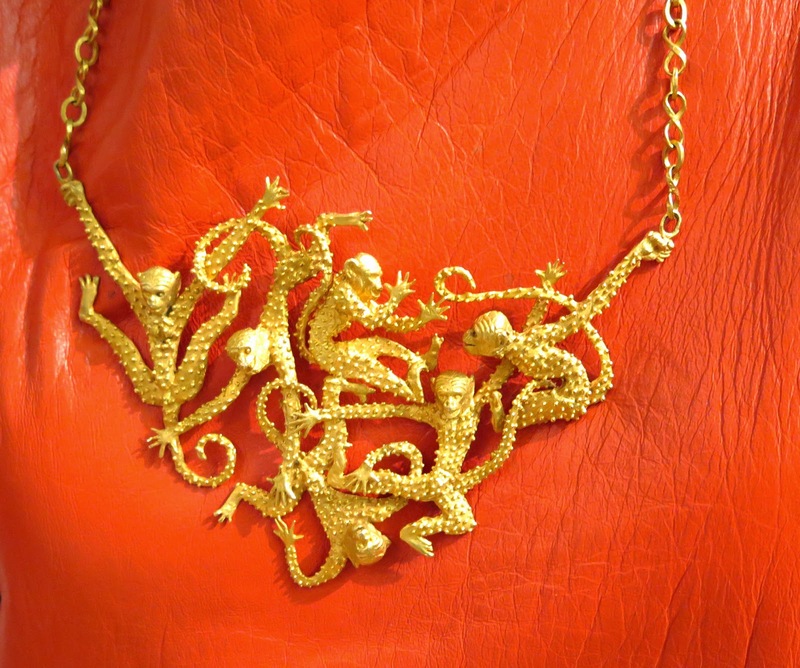 A closeup of the de Kolb necklace. I had never heard of the designer before and this was another example of how the vintage show is often as much a learning experience as it is a treat for the eye. 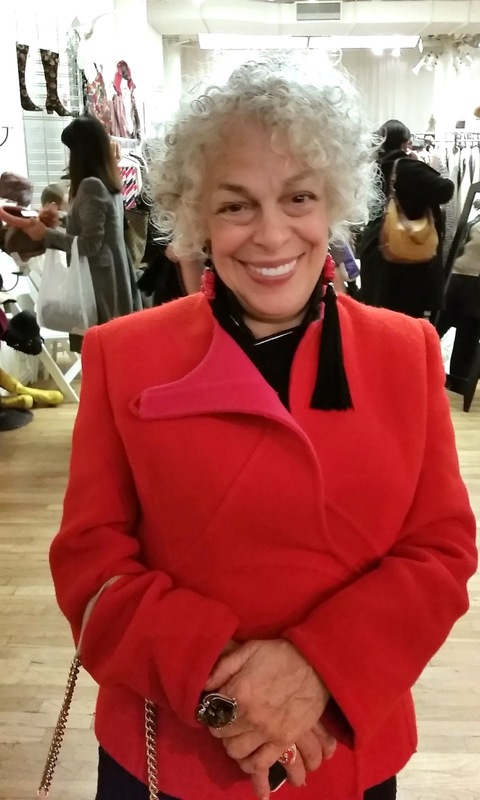 We had the pleasure of running into actress, comedienne, and singer, Marilyn Sokol, wearing a beautiful jacket and a pair of spectacular earrings she found at Off Broadway Boutique. Sokol has been featured many times on Ari Cohen's Advanced Style Blog. We had oohed and aahed over this funky men's jacket at Icon Style and lo and behold, this brave man was taking if for a test drive. I think he wore it very well, and I do hope he took it home. I met Israeli jewellery designer Ronnie Sarnat, whose custom-made green boots and stunning sequin-embroidered jacket stopped me in my tracks. She asked that I not photograph her, but was very gracious and showed me some photos of some of the jewellery pieces she has created. She uses bits of vintage accessories and clothing to create pieces that are contemporary works of art, and is particularly drawn to the sensibilities of the Art Deco and Art Nouveau periods. The blue bead and sequin piece on the bottom right was made by her, as was the beautiful jacket she was wearing. 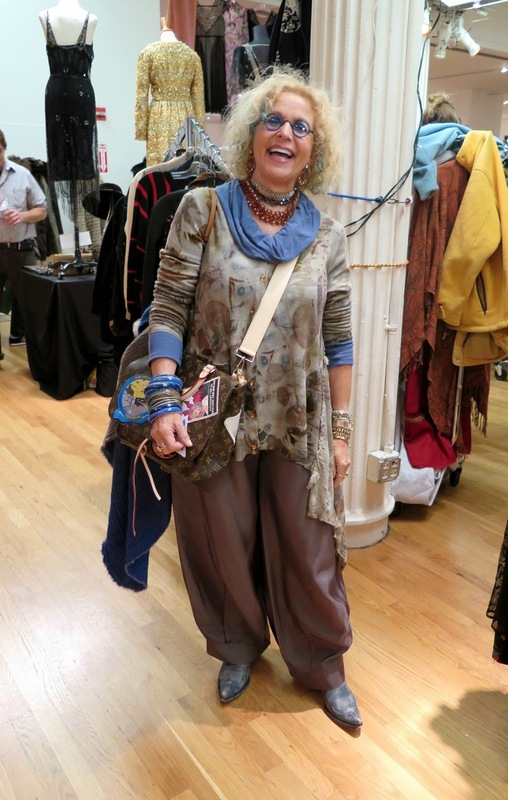 The vendors at the Manhattan Vintage Clothing Show and Sale are often the best advertisement for their merchandise. 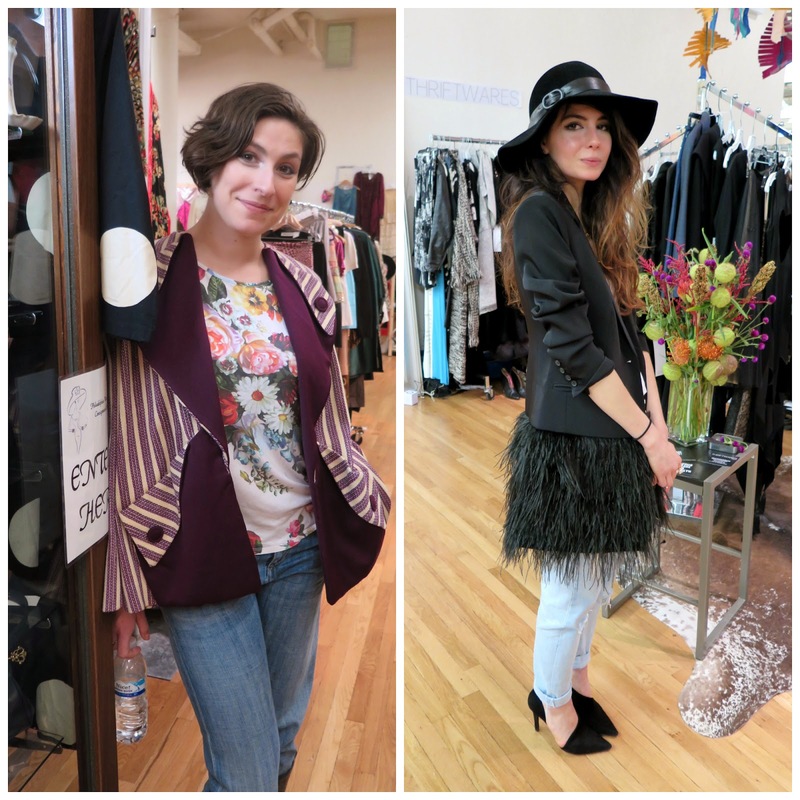 Some wear a specific era head-to-toe, but many mix and match from different decades, and all are happy to show customers how to incorporate a vintage piece into their wardrobe. (left) Kathryn and Selima from Bond 07 by Selima (right) Tim and Heather from Noble Savage Vintage I'm always curious to see what crazy socks Tim will be wearing. 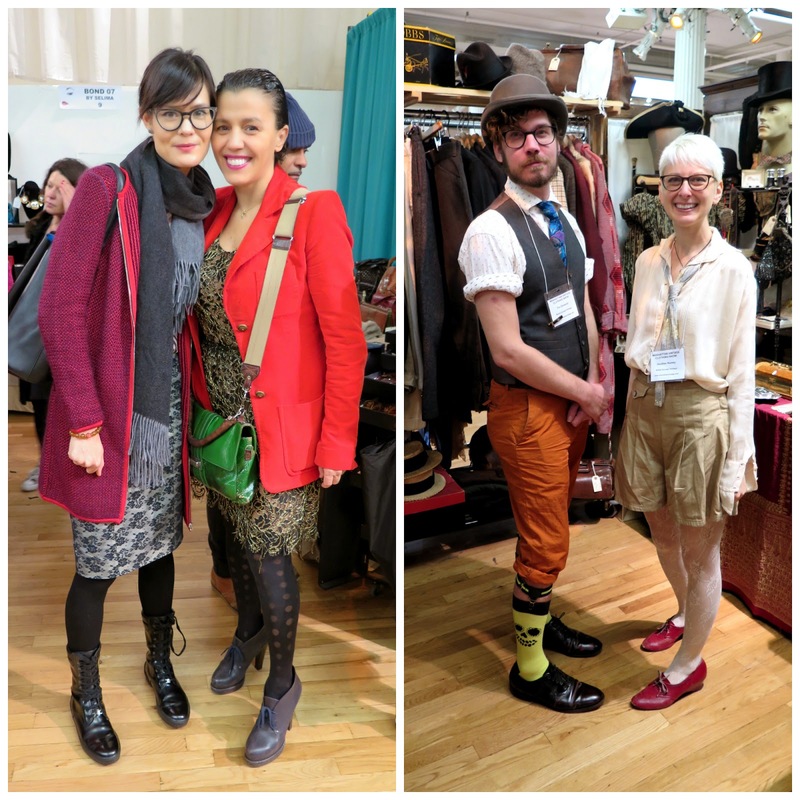 I admired the drool-worthy 1940's jacket on the woman working at the Philadelphia Vintage and Consignment Shoppe booth (left), and the feather-trimmed jacket on the woman at the Thriftwares booth (right). The gorgeous gals in the circle skirts are (left) Meika, owner of Another Man's Treasure, and her assistant, Ally. 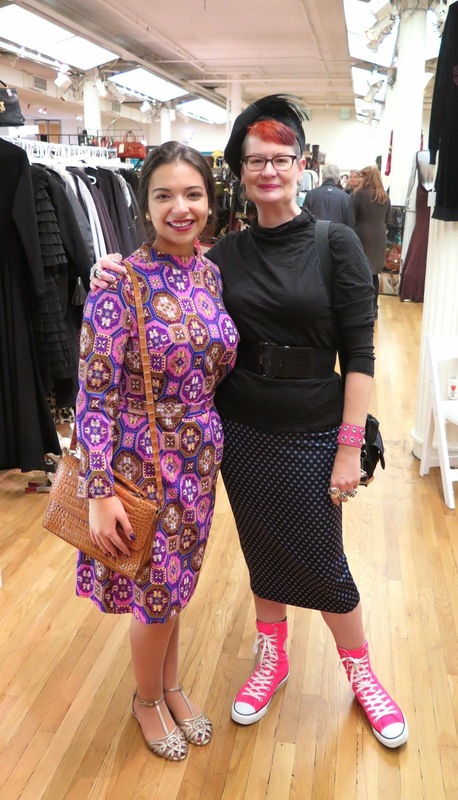 The incomparable Yardena, of Lulu's Vintage Lovelies. Her style has a cool punk edge to it, and I was kind of flattered to see that we had the same taste in footwear. I wore the identical silver Doc Martens to the show last year. 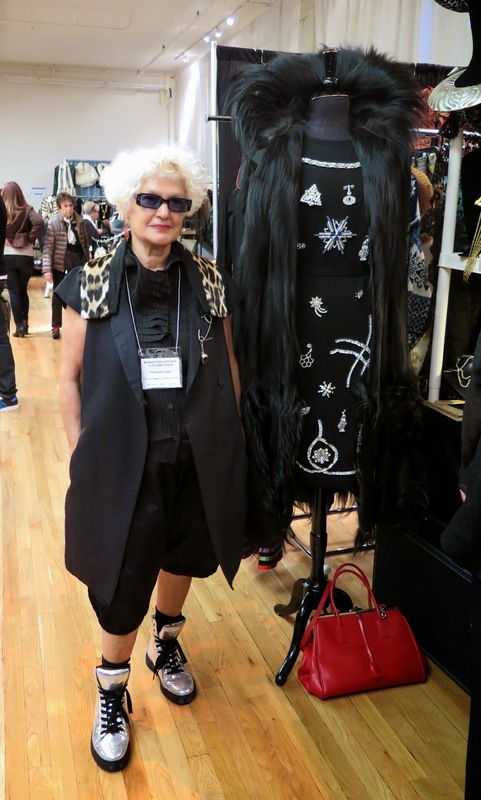 The monkey fur coat and embellished dress are from her booth. Theo, at the Morphew booth, was channeling his inner Johnny Cash/bad guy this year. This young woman looked so cute in her romper and converse, but I think she was wishing she had gone for something warmer, as it was kind of chilly in the venue. Well, Th-th-th-that's all folks, for another year. 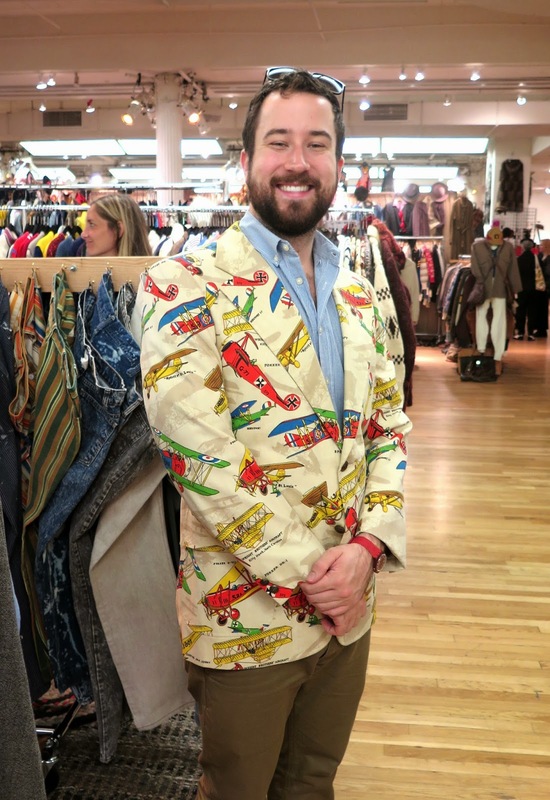 If you enjoyed your vicarious trip to The Manhattan Vintage Clothing Show and Sale with me, just imagine how much fun it is in person. The next show is on February 6th and 7th, 2015, at the Metropolitan Pavilion. I am so jealous!!!!! This looks amazing. You look fantastic! 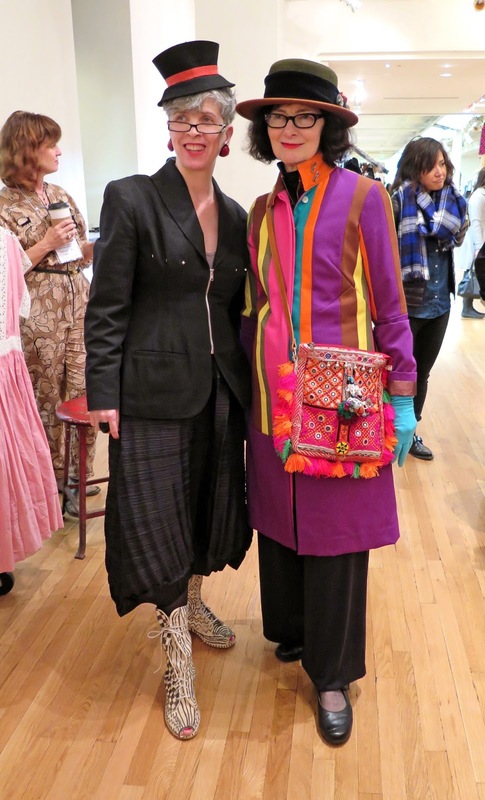 How awesome to see Patti and all the other fashion divas! And the vintage! I want to wear the whole outfit of that dude in the embroidered coat and boots. I also want the sequinned jacket from the Israeli artist!!! My favourites were the young man's embroidered coat and of course the PUG!!! how cute is Bibi? 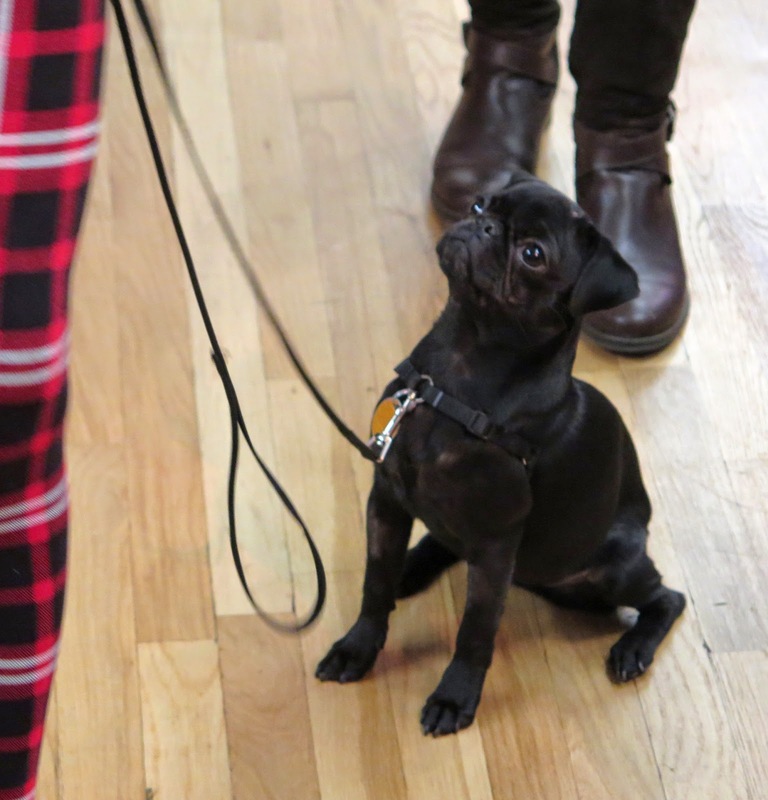 A black pug puppy! Adorable! Could this really be the most magical place on earth?!?! I think so! I would have gotten into a drag out brawl with that gent with the embroidered coat, beautiful! I think I would die here of sensory overload but at least I'd be smiling! I really wanna go to this I just have a feeling I'm too much of a bargain hunter, i think I'd go broke! I had to tell you that I bought a pencil skirt, me and seeing you in yours I know where I got the idea! Thanks darling and yes I did do my hair, it's crazy bright like a sunset, orange and pink! It's reasly hard to photograph but I'm trying! How wonderful to have found your tribe. I can see that they are "my tribe" too, except I've never met them in person. I just know I would drool and my eyes would fall out of my head if I saw such fabulous things as what you've shown us through your photos. Many thanks for being my alternate self and being there for me. Maybe someday I'll come too! Amazing vintage looks! I'm green with envy. I wish there would be more vintage shops in my area. Have a great week! WTF was that Boycott American Women thing?! Crikey! I bloody well deleted that rubbish! Hello darling! 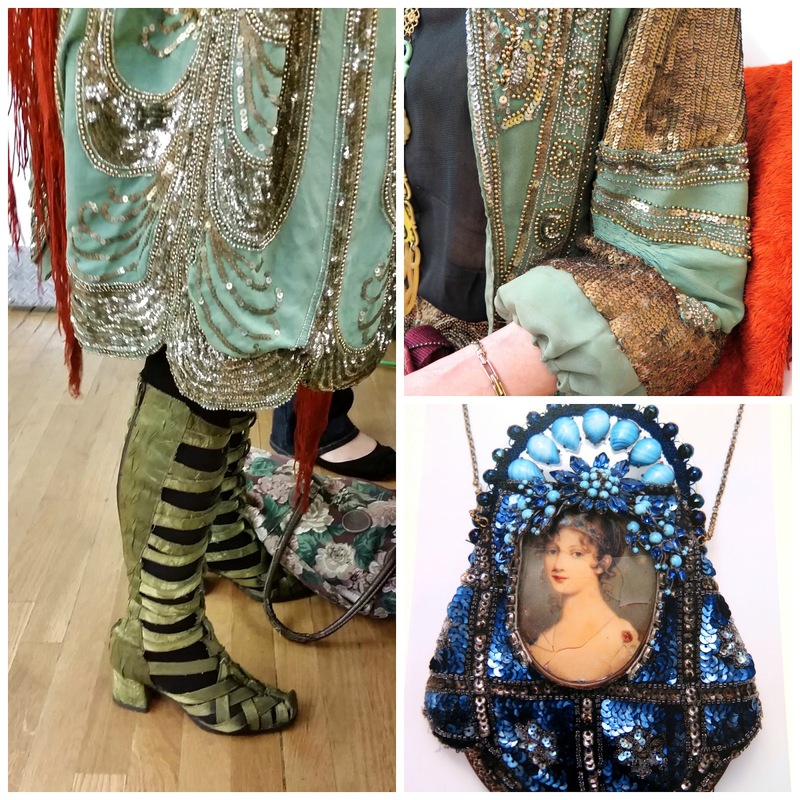 Such a lovely, exciting post, with loads of details I am dribbling over, like those green boots and sequins, the circle skirts, the fine young man, the de Kolb necklace (OMG! 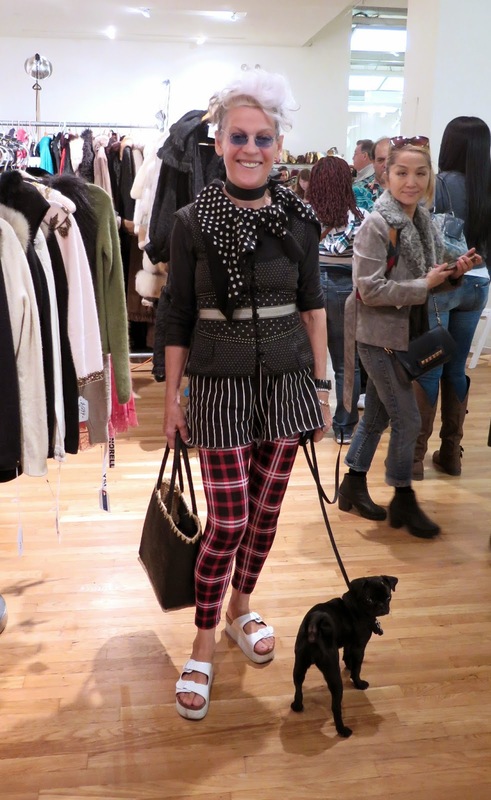 ), the adorable Bibi....a lot of inspiration here, such great outfits, and what a turn out! New York looks more enticing to me all the time! I am in love with this post. You, Jean, Valerie, Carol, Patti, Lyn. Bloggers looking spectacular and having great fun together. What could be better? So much eye candy that I'm feeling myself needing a NYC fix. 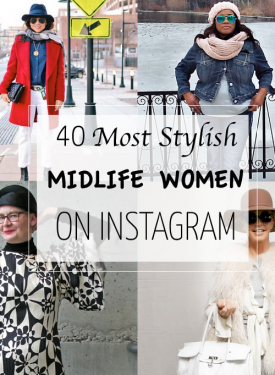 Thanks for putting together gorgeous photos of beautiful people, wearing vintage and hats to live for. Brava! Made my day! There is so much here! that I wish this post were in magazine format so I could slowly turn the pages and feel the paper. I got lost there for a bit in Ms. Sokol's links and watched her in the web show. You know so many interesting, passionate people, including Patti now. And the cutest puppy pug ever. What a trip. You fit right in with this crowd - these are your people. I'm so glad they're there. Love, love, love your coverage of the show, the vendors, the merch! Spending time with you is always a treat. Come back soon.